Wasn’t this supposed to be Rhett’s ‘training journal’? Yes, it was and will continue to be…..so why am I still writing about all this personal growth stuff? What do I wish to help you discover? I hope to show you the discoveries I made about myself when this journey began and that you find some lessons for yourself ! Or should I say Rhett hopes his ‘lessons’ to us will help you discover your very best self !! 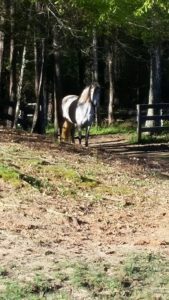 The things I discovered about myself, the things I had to experience, accept, embrace and change to ‘help’ me help Rhett, had absolutely nothing to do with my horsemanship (initially). The sequence of events of our journey and story! 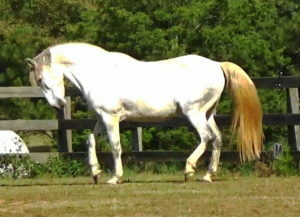 This is more than horsemanship, this is about life….life-man-ship ! And this was where I began to find my heart-centered purpose for being in Rhett’s life! 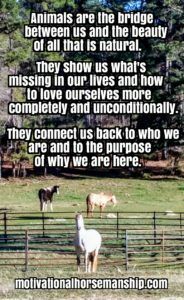 My hope is to help you find the connection with your horse that strengthens all your relationships ! 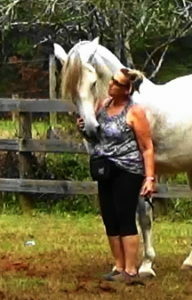 My hope is to guide you to learning truly why and how to be your horse’s advocate! My hope is to offer you a new ‘tool for your toolbox’ with my science-based training methods. But most humans only think about methods and techniques. It makes sense to them. It seems to work for them. They seem to think the results they see are in the horse’s best interest. And in their best interest. That’s human nature. Three minute video of Rhett and ‘friendly encounter’ with whip and lash. This ‘seemed’ to work for us, a friendly ‘encounter’ with a lunge whip and lash inside the dreaded round pen. It worked (I thought) because he was standing still. 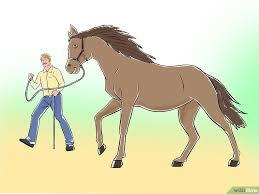 It worked (I thought) because he didn’t kick out at the lash around his hind legs or his hindquarters. It really seemed to work. 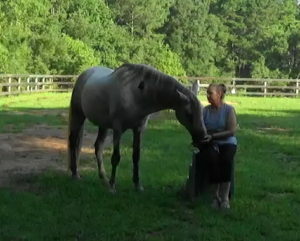 On this part of our journey, Rhett was to teach me about the meaning of real intention. To me. To us. 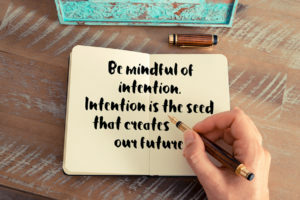 What are intentions and how can they help us change and grow!? It had absolutely nothing to do with methods and techniques. It had to do with Rhett being the ‘teacher’….and me being the open ‘student’. Funny thing, I thought that I was the teacher and the one responsible for teaching, guiding and ‘empowering’ Rhett. After all, I was the smarter of the two. And I thought I was the stronger willed of the two. With the progression of my personal development , I had to make ‘changes’ in myself before I could help Rhett make changes. I had to learn who I was. I had to learn to trust me. I had to learn to love me. For yourself, think of it as ‘growth’ if the word ‘change’ scares you. It hold negative connotations for many. Change is hard. If someone or something tells you you need to ‘change’, this can imply the feeling that you weren’t good enough before. That will change as you learn and accept that you have always been good enough. This is where the exploration and growing awareness of the changes in ourselves began. “Let me guide you to seeing enlightenment in me, in the horse and with that, you will also see enlightenment in yourself” Rhett softly spoke. Rhett told me if I’m not willing to put in the ‘work’ on myself, he couldn’t share with me what he knew I needed to know! He was the embodiment of heart-centered! “When you transform yourself, everything in your life gets transformed” Rhett said. Rhett finally began to feel safe enough with me not to lie or to cover things up any longer. He offered his honest and truthful feedback in each moment. This enabled me to become more aware of my conscious and unconscious energy and both our intentions. When I looked deep enough, Rhett’s behavior during our interactions caused me to step back and become more aware of my attitude, my emotions, my boundaries, my communication skills and my body language, all things he would continue clarifying for me. Learning how to set positive intentions created a strong sense of ourselves and created new, healthy patterns. As we moved deeper into our relationship and training, Rhett and I began to practice ’empowering’ our intentions. And even though I had ‘dabbled’ in intention setting, I hadn’t truly explored it for what it is or could be. As an energetic being, Rhett already totally ‘owned’ his intentions. Through Rhett, I learned that intention was power. Creative power. It was where our desires and dreams began. As we gleened, our intentions needed to be positive. Focused intentions, set positively, helped quiet the critical head-space voices that could side track our growth and journey. Negative focused intentions, not knowingly set, rolled things into motion that neither of us were expecting or ready for. It was power! So now, I was learning how to use positive intentions for both our higher goods. However, clear positive intentions were not passive, they required both of us to put personal work into actualizing them. And work we did! Our time together helped us make decisions that affected us most in the moment and held us accountable for those decisions. Getting in touch with your intentions is the first step to building a bridge to experiencing them. That was the empowering part! Setting an intention is like drawing a map of where you wish to go…it becomes the driving force of the path you are headed down. 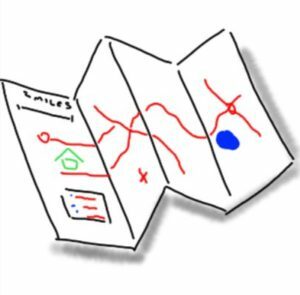 Without an intention there is no map, and you’re just driving down a road with no destination in mind. Once I realized how powerful the positive intentions could be between us, the sky was our limit !! 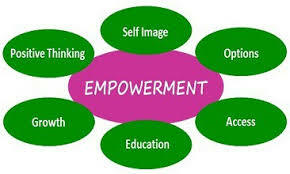 ‘Empowerment’ is responsibility and we are responsible for the choices we are allowed and empowered to make. And with empowerment, these are a few of our areas of ‘choice to change’ in the relationship. Empowering each other was not always easy with me and Rhett. Sometimes we didn’t understand each other’s intent. Sometimes we weren’t truly aligned with our stated intention. Good ‘leaders’ empower, but always check to see that their empowerment and intention is understood and working. Sometimes the ‘check’ would slow our progress but our intention remained in place. 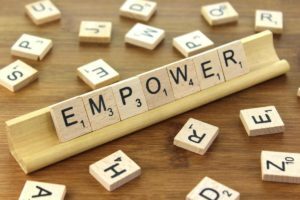 Empowerment creates good leaders and good leaders create empowered intentions. 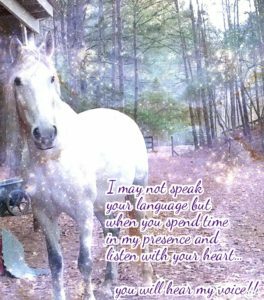 As a leader for your horse, communicate your intent and encourage your horse to contribute to the conversation. 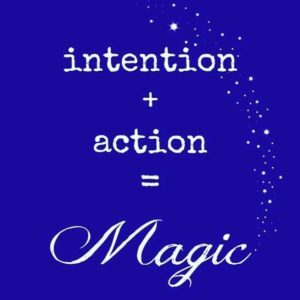 Intention + Action = Magic ! Listen to them, understand their ‘recommendations’ to improve the communication and incorporate their ideas to follow the intent. I was always checking to see if my intent was being followed, if Rhett understood the request and we were progressing forward. This was done with a combination of awareness, clarity, effectiveness, listening and trust. All those written words to say…. Rhett was MY ‘empowerment’ teacher! He was to be the teacher. I thought we were brought together so I would be his teacher. Nope, not this time around! For over two years from when Rhett and I began our story, I experienced the beginning and early middle of my growth years, my change years, my finding ‘myself’ years and my becoming a true ‘student’ years. 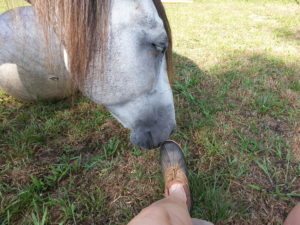 Rhett was learning to be a horse and live in a herd. Rhett learned how to be a ‘teacher to humans’, instead of a ‘submissive’ to man’s whim, always on the defensive and angry with the world. And I was his willing student! 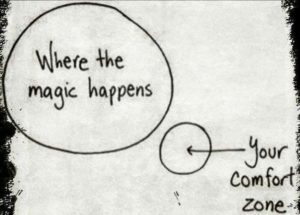 What changes have you made to move you to creating your dream? Next blog, back to the training part of ‘Rhett’s Journey – The Story of A Rescue’, as it was originally called when I started Rhett’s Facebook group in October 2013. 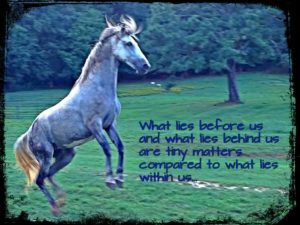 Please join us in his Facebook group renamed “Rhett’s Journey – To Wholeness” !